Semi Detailing | Shamerrific Shine – KANSAS CITY’S PREMIERE AUTO DETAILING SOLUTION! Semis are no exception to the rule that making a good first impression is one of the most important things a person can do at work and in life. Independent drivers use our services to keep their truck, the heart of their business, looking even better than the day they bought it. Fleet drivers and their companies use Shamerrific’s semi detailing services to protect the image of the company they represent. Semi owners and drivers have access to all of the same detailing services we offer to those driving small smaller vehicles, plus we can do it on your schedule and where you specify. 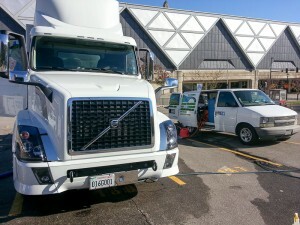 In addition, we offer fleet management services, enabling us to offer full semi fleet detailing on request. The scope of the detailing work we perform depends on the client’s needs. To get more information about getting your semi, or your company’s fleet, detailed, please contact us.